Last week and this, Stu at Winston’s Dad has been celebrating Pushkin Press. Founded in 1997, Pushkin are one of the UK’s leading publishers of translated fiction. I haven’t read many of their books, but, as I’m reading more translations this year, I thought I’d take the opportunity to explore further. 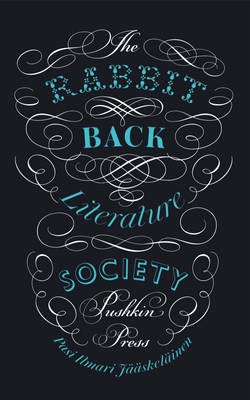 The Pushkin book I’ve been reading is Pasi Ilmari Jäaskeläinen’s The Rabbit Back Literature Society (2006; translated from the Finnish by Lola M. Rogers, 2013). In the little town of Rabbit Back, a teacher named Ella Amanda Milana is disconcerted to find her students submitting essays based on copies of classic texts whose plot details have changed Sonya shooting Raskolnikov at the end of Crime and Punishment, for example. At the same time, Ella receives an invitation to join the Rabbit Back Literature Society, an exclusive writers’ club run by the town’s most celebrated author, Laura White. At a party to welcome Ella into the Society, Laura White disappears in an indoor snowstorm – and Ella sets about investigating what happened. She makes use of ‘The Game’, a Society ritual in which members must answer truthfully any question put to them, however painful it is to do so. Ella discovers that a former member of the Society disappeared many years ago – could Ella be next? There’s a wonderful dissonance to the opening sections of The Rabbit Back Literature Society, as the town and its inhabitants (and Jäaskeläinen’s prose) exhibit a playful theatricality that contrasts with some very real tragedy. On the basis of this, I thought I knew where the book was going to go; I expected a fairly straightforward fantasia, something along the lines of Mr Penumbra’s 24-Hour Bookstore. Not quite. As the novel progresses, it becomes clear that Rabbit Back is a place which has become infested with story; Laura White’s tales of fantastical creatures have shaped the way in which the town is perceived, by outsiders and denizens alike. White also appears to have had some kind of hold over the members of her Society; and one of the key things about them is the extent to which they have used other people as sources of material for their own writing. This is reflected in The Game: the idea is not to tell a story in response to a question, but to ‘spill’ – to surrender all the raw, unshaped information one has about the subject raised. It’s all, in a way, reflected in how the novel treats Ella: it is not until well into the book that we start to hear her answers to the challenges she receives through The Game; her emotional responses – such a crucial part of the individual she is – are withheld from us. This is what it’s like, Jäaskeläinen seems to say, when you take away part of someone. The jarring dissonance of the early section doesn’t carry through to the later parts of The Rabbit Back Literature Society, and it’s hard not to feel a pang of regret about that. But what we have instead is intriguing an exploration of how stories can define us, and what it means if reality doesn’t measure up. Some other reviews of The Rabbit Back Literature Society: Beauty in Ruins; The Complete Review; Whimsies & Words. I like the sound of this. Like you, I haven’t read much from Pushkin Press but if this and Butterflies in November – an Icelandic novel with more than a touch of Murakami about it – are anything to go by it’s time to start seeking them out! I am liking the sound of this!